While Domaine Jean Royer is a fairly new estate in the Southern Rhone Valley that only dates back to 1985, the Royer has roots in Chateauneuf du Pape that go all the way back to the 1700’s. Before becoming a family of vignerons, they practiced several trades, including bricklayers and construction. In fact, members of the Royer family helped build Chateau Fines Roches. Like many vineyards, Domaine Jean Royer either sold their harvests to negociants or rented out their vines to other producers. That changed in 1985, when the young Jean Royer changed things up and began producing, bottling and selling their own wine. However, there was one obstacle in their path. Until 1985, the property went under the name of Clos des Marquis. That name was considered to be too close to the famous wine, Clos du Marquis produced by Leoville Las Cases in St. Julien, Bordeaux. 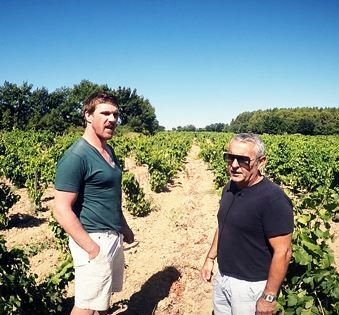 To avoid confusion in the market and to make sure they had no problems with the Delon family of Leoville Las Cases, the name of the property was quickly changed to Domaine Jean Royer. If the name of Jean-Marie Roye, who manages the estate today sounds familiar, it is due to his earlier career as a Rugby player. One of the next important decisions made by Jean Royer was to bring in Philippe Cambie as their consultant in 1988, when Philippe Cambie was just starting his career. Domaine Jean Royer owns 5 hectares of vines in the Chateauneuf du Pape appellation. Their vines are located in two main lieux-dits. Until recently, 80% of their grapes are planted in Bois de la Ville and 20% of their vines are located in Les Grandes Serres. Domaine Jean Royer produces 5 red Chateauneuf du Pape wines and 1 white Chateauneuf du Pape wine. Domaine Jean Royer Tradition is a blend of 75% Grenache, 15% Syrah, 5% Mourvedre and 5% Cinsault. But that blend can vary as in some vintages, no Cinsault is used in the wine. The vines are planted in the La Crau and les Grandes Serres lieux-dits. Their terroir is mostly rocks and stones, with some sand. 50% to 90% of the grapes are destemmed. The wine is aged in a combination of used, French oak barrels and demi-muids. On average, 350 cases are produced of this wine each year. Domaine Jean Royer Cuvee Prestige is made from mostly old vine Grenache from vines that are between 80 to 100 years of age. However, some of the Grenache vines are even older than 100 years. The terroir is pure galets. The wine blends the old vine Grenache with up to 20% Mourvedre. All of the fruit comes from the Bois de la Ville and les Grandes Serres lieux-dits. 50% to 90% of the grapes are destemmed. For the aging, 50^% of the wine is aged in demi-muid, while the remainder is aged in tank. About 350 cases are produced in an average vintage. Domaine Jean Royer Cuvee Hommage a Mon Pere is made from 100% old vine Grenache from the Grandes Serres lieu-dit. The youngest vines are at least 80 years of age and the oldest vines were planted back in 1890. About 350 cases of this wine are produced each year. Domaine Jean Royer Cuvee les Sables de Crau is produced using 100% old vine Grenache from sandy terroir in the La Crau vineyard, as the name suggests. The wine is aged in used demi-muids for 12 months before bottling. Domaine Jean Royer Sola Syrah Regalis is one of the few wines from Chateauneuf du Pape made using 100% Syrah. 50% to 90% of the grapes are destemmed. The wine is aged in 100% new, French oak barrels for 12 months before bottling. The wine is only produced in select vintages and when it is produced not much is made as the production hovers between 100 and 125 cases. Domaine Jean Royer Chateauneuf du Pape Blanc is blended using 50% Grenache Blanc, 30% Bourboulenc and 20% Clairette from a small .85 hectare parcel of vines. Domaine Jean Royer can be enjoyed on the young side. Young vintages can be popped and poured, or decanted for about 1 hour, more or less. This allows the wine to soften and open its perfume. Older vintages might need very little decanting, just enough to remove the sediment. Domaine Jean Royer is usually better with 3-5 years of bottle age. Of course that can vary slightly, depending on the vintage. In the best vintages the wine should be consumed within 4-14 years after the vintage. Domaine Jean Royer is best served at 15.5 degrees Celsius, 60 degrees Fahrenheit. The cool, almost cellar temperature gives the wine more freshness and lift. Domaine Jean Royer is best served with all types of classic meat dishes, veal, pork, beef, lamb, duck, game, roast chicken, roasted, braised, barbecue, stewed dishes, sausage and cassoulet. Domaine Jean Royer is also good with Asian dishes, hearty fish courses like tuna, mushrooms, pasta, eggplant, cheese and tomatoes. The white wine of Domaine Jean Royer is best served with a myriad of different seafood dishes, shellfish, crab, lobster, sushi, sashimi, chicken, pork and veal, as well as Asian cuisine. Domaine Jean Royer also owns vines in the Cotes du Rhone appellation where they produce Le Petit Domaine, a red Vin de Table. Lusciously textured, with sweet, juicy kirsch and cherries, you also find tobacco, pepper and herbs to add nuance. The wine was made using 90% Grenache, 5% Syrah and 5% Cinsault. Polished, silky and fresh, the fruits are ripe, sweet and delicious. Loads of kirsch here on the palate and nose, with even more fruit in the juicy, elegant, fresh finish. The wine was made from 100% old vine Grenache from vines located in the La Crau lieu-dit. Medium bodied, fresh and sweet with a tobacco and spice note to compliment the fruit, the wine is already approachable, due to its forward charm, leaving with wild strawberries and on the nose, and palate. The wine was made using 90% Grenache, 5% Syrah and 5% Cinsault. Freshness, minerality, sweet, wild strawberries and juicy, ripe kirsch notes create the profile. The wine is supple and sensuous in texture and will offer nice drinking pleasure on release. Medium bodied, sweet, fresh, vibrant, peppery, spicy cherries, wild strawberries and black raspberries are easy to find on the nose, and on the palate. The soft, sweet, fruit filled quality carries through to the finish. Any Chateauneuf du Pape made from 100% Grenache planted in one of the best vineyards on La Crau should have it all going on, and this does for sure. Pure, liquid kirsch, garrigue, black pepper and wild raspberries are in full force. The lusciously textured, fruit filled finish hit the spot too! Rich, luscious, ripe, dark red fruits, thyme and a blast of sweet kirsch hit the spot. The wine offers freshness, ripe fruits and it's in a forward, approachable style, so you can drink it young, for its primary appeal, or age it, for more earthy, secondary characteristics. Medium/full bodied, with ripe, black cherries, thyme and kirsch on the nose, the texture is soft, and polished, leaving with more, sweet, spicy, red fruits in the round, polished finish. Concentrated, with depth of flavor, along with tannins and acidity, the wine, while well made, and showing a lot of dark, red fruits, does not quite rock my boat. This is my first time tasting a Chateauneuf made from 100% Syrah. While the wine is certainly interesting, it does make it obvious as to why Grenache is King in the region.